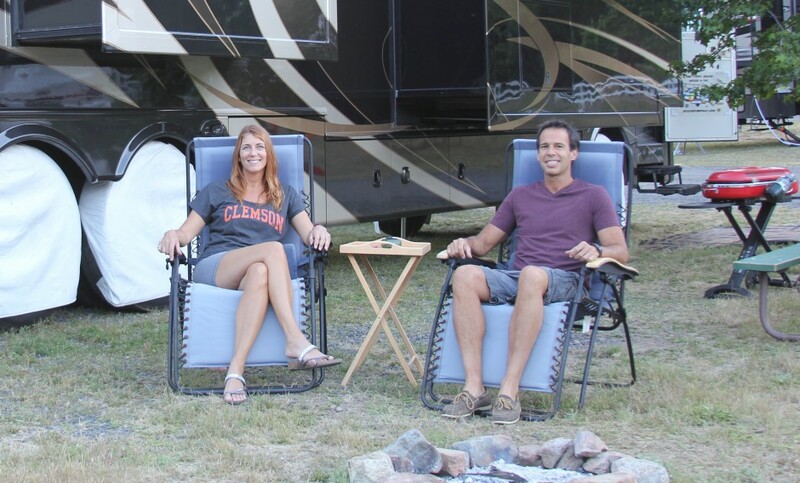 We started going to RV shows in New England in January 2014, with the plan to begin our massive transition from stick house to full-time travelers in August. Mitch had some experience in vacationing in rental RVs, but had never bought one. The two of us explored dealerships, opened closets and drawers in all kinds of units, and read buyers guides, independently coming to the conclusion we needed a premium unit (we’d have liked a million-dollar model, Ooooh! But can only afford something a fraction of that). We rented a 37′ 2007 Winnebago in April and took it for a long weekend, just to make sure this was the lifestyle we wanted (especially me, because I hadn’t spent more than a couple days in an RV 30 years ago). It was indeed exciting and everything I’d hoped, except, well, I was sure that 37′ would be too small for two of us to live and work in for an extended period. He agreed. That’s just us. So we pored over floor plans, comparing them side by side. We made a list of must-haves for our needs: 38′ in length or more, Class A diesel pusher, dishwasher, washer-dryer, king-sized bed, extra computer desk or workspace for two, residential refrigerator, booth seating, closet space, two bathroom sinks. Each decision was well researched. Meticulous. We are nothing if not skilled, careful planners! We narrowed our decision down to several makes: Thor. Allegro. Phaeton. Entegra. Anthem. We debated. We discussed. We quibbled, crossing off a make and model, only to put it back on the list. We painstakingly searched for months on end, visiting every used and new RV sales site we could find in person and on the internet. Friends told us, “Hey, I saw a big used RV for sale a few streets over!” (Too small.) We found potential candidates for sale within a few hours’ drive, but would find it had already sold, or it didn’t have a dishwasher. We would have to compromise. We wanted the value of a used RV, but couldn’t find that elusive work space with a desk in a used unit. Or if it had a desk, it didn’t have enough closet space. The first thing “they” said (and by they, I mean dealers, RVers, experts, and anyone you ask who knows), is the one thing you should never do is buy a new RV and expect to start an extended trip right away. Nuh-uh. The forums are full of people’s woes of all the trouble they’ve seen. But when we found a perfectly reasonable new candidate at a Camping World dealership in Gulf Breeze, FL, we contacted them immediately. It was a 45′ Thor Tuscany, brand new. It had a desk. The kitchen was a bit small for such a long unit, it was missing booth seating, but everything else…boxes checked. We felt that Thor’s quality was only so-so, but it was the number one selling brand in the U.S. and Canada for Class A diesel pushers of that length, the price was deeply discounted, and another guy from Boston was about to buy it, so…we jumped. We put down a deposit and flew down to Florida from Massachusetts to look at the unit. We bought it on the spot (sorry, other Boston guy — we heard he was very upset). The 2014 Thor Tuscany 45 LT: Love (and anxiety) at first sight. Comes with a desk and impossible-to-keep-clean white tile and upholstery. And that vexing refrigerator. When you buy a premium motorhome brand new, dealers offer to set you up and show you how everything works. These are complicated systems, involving floors, windows, appliances, plumbing, HVAC systems, not to mention a massive, complicated engine chassis. They teach you how to drive it (you don’t need a special license in spite of the engine brakes, tag dump switch, and diesel exhaust fluid indicator). They put you up at a nearby campground overnight to do a sort of “walk through,” like you would in a new home. It gives buyers a chance to identify everything that needs repair or finalizing before you drive it away. We did that, and came up with a list of over 12 items that needed attention: The freezer was missing a gasket that sealed the door, so nothing would freeze. The central vac wasn’t operational. The thermostat only cooled in two zones (which at 96F in Florida humidity is a major issue). The interior trim needed repair in several places. The front door entry lock combination access code didn’t work, so we couldn’t change the combination. And so on. We knew we would still have niggling issues and loose ends hanging. But we were very excited to take delivery of our unit in July, with several weeks to go before starting our trip. “We did it,” we thought! And we were very excited when we finally flew to Florida once again to drive our new RV home to New England. Oh, the lessons we have learned. After leaving the dealer, exhilarated to be taking our new fancy RV home, we stopped to get supplies, and within an hour, during a lane change on a bumpy boulevard, the contents of the refrigerator, including a 12-pack of Bud Light Lime in bottles, crashed out onto the brand new tile floor in a mess of shattered glass and sticky, limey beer. We didn’t expect that the residential refrigerator would just fly open around a corner. A residential refrigerator is nice and big, but it isn’t built specifically for an RV, so it doesn’t have a latch or lock like the Winnebago’s smaller RV-friendly fridge and every other RV (and fancy boat) we’d ever traveled in. Nobody told us we would have to secure it with a black strap (so that’s what those belts are for). To be fair, we think the dealer probably didn’t really know either. They sell a lot of RVs, but not so many units this size. We cleaned up the mess, but the next corner we took (very carefully and slowly, I might add) sent the 8 remaining beer bottles crashing to the floor again from a lower shelf (nothing broken this time). It took us a while to find the solution. We tried not putting heavy items in the doors. We installed double-sided Velcro strips around the door handles. My friend Ann gifted us with a box of refrigerator containers from Costco, which helped, but still the fridge kept slamming open when all the contents inside shifted. It took a few more shattered cartons — and a lovely blend of tomato juice and soy milk and hummus running onto the new tile grout and into the beige carpet — before we found the solution (so we think). We fitted the shelves with non-skid backing — the kind you put under throw rugs. We also fit this non-skid backing stuff into all the cabinets, and ordered brace bars–you’d think an RV this size would have the type of shelving you’d see on a boat, but it doesn’t. We Velcroed the refrigerator containers to the shelves. And each time before we hit the road, we make sure to belt the darn refrigerator handles together as firmly as possible. We like to say that now we know why trailer-park people buy beer in cans. All I need now are some pink fuzzy slippers, a muu-muu, and next thing you know I’ll be using the cans to roll my hair. Mitch will need a wife-beater t-shirt, and we’ll have to learn how to brawl so the neighbors can hear and leave the dog barking all night. All in a day’s work. It’ll come, the trailer trash life. In my next post The Trouble with the Love Shack, I dig a little deeper into the problem of new versus used and getting repairs done either way. I hope you enjoy reading about our adventures. I love to get comments and followers, so please subscribe and fee free to share and post your feedback and experiences! Start from the beginning here, at Hello World, It’s the Mitch and Val Show 2014-2015! Beautiful RV and funny story. It’s hard to say. 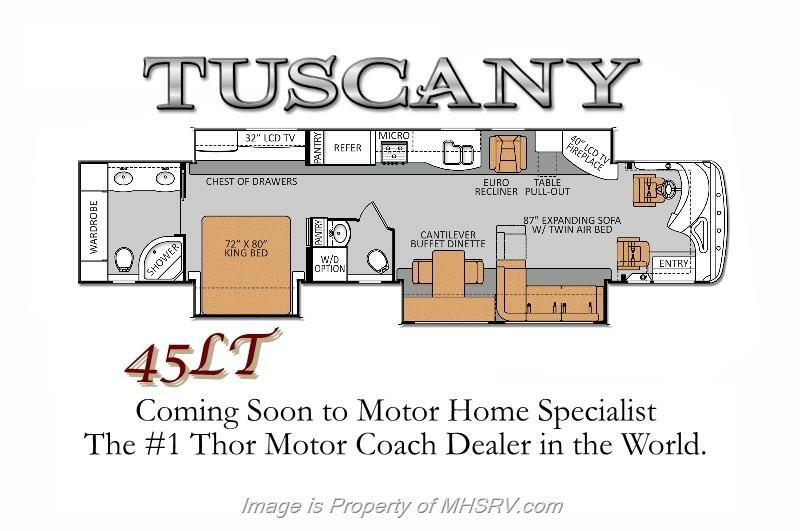 We would buy *our* 2014 Thor Tuscany 45LT coach, if it were on the market and it fit our needs (it still does, in 2017). We have worked out the kinks over more than 40,000 miles of travel and have done many upgrades. The first 10,000 miles were the roughest with things going wrong. I would be very careful to do due diligence on a unit with 9500 miles on it. Ask for all the records of repairs and warranty work performed so far — if it’s a small list, I would wonder if the owners haven’t really put enough time into it. All new units require a lot of time fixing the mistakes and slap-dash manner in which they are manufactured — whether it’s a $2M Prevost or a cheap-o brand. It’s all done by hand, not automated like in today’s vehicles. That said, 9500 miles is better than zero, in our opinion. 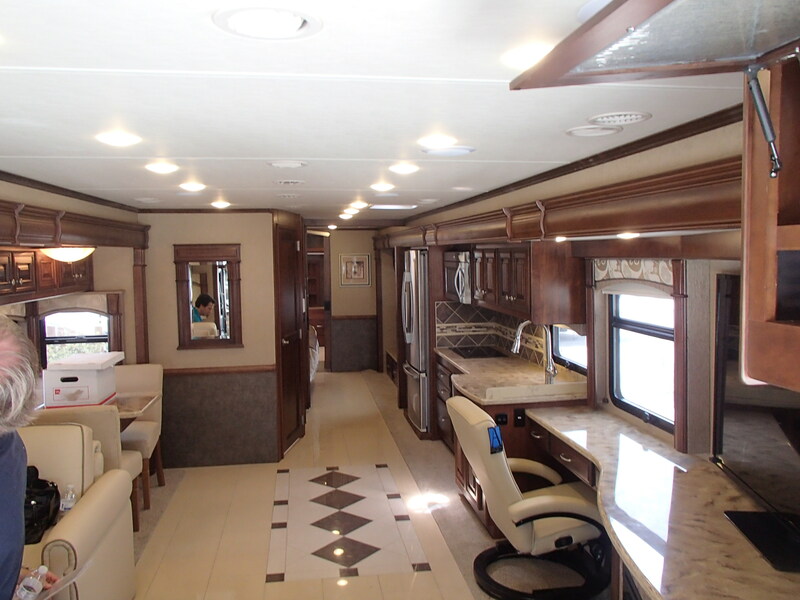 I would highly recommend you get a quote on an extended warranty on any coach or RV you buy. It’s peace of mind!